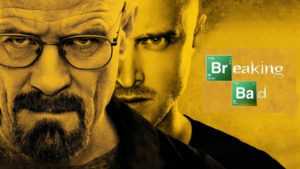 Premiering on January 20, 2008, AMC’s Breaking Bad is widely considered one of the greatest television shows of all time. The series, and its stars, captured numerous awards, including 16 Primetime Emmy Awards and two Golden Globe Awards. The show’s star, Bryan Cranston, won four Primetime Emmy Awards for Lead Actor in a Drama Series, while co-star Aaron Paul won three for Outstanding Supporting Actor. The show, set in Albuquerque, New Mexico, follows the story of Walter White, a high school chemistry teacher who is diagnosed with terminal cancer. Facing death, White is depressed at the legacy, or rather, lack of a legacy and lack of financial stability he will leave behind for his family. To secure his family after his death, Walter “breaks bad”, turning to a life of crime. He uses his knowledge of chemistry to produce and distribute crystalized methamphetamine, with the help of a former student, Jesse Pinkman (Aaron Paul). To disguise his identity, White adopts a street name: Heisenberg.